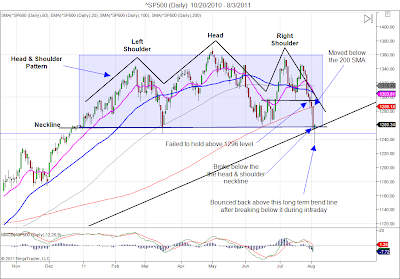 While market participants are waiting for the SP500 to come back down and test the 8/9/11 low of 1101.54, the index is making a turn toward the H&S neckline it has broken near the 1260 level. 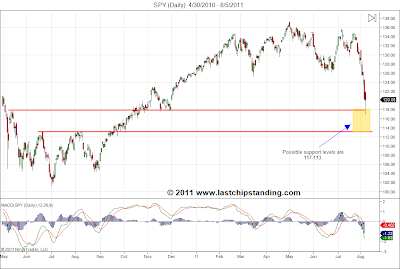 Here are the updated price charts for the SP500 and its ETF, SPY. After the price of gold made a new high last Monday, it sold off and its ETF, GLD, dropped from a price near 185 to just below 166 in less than 3 trading sessions. 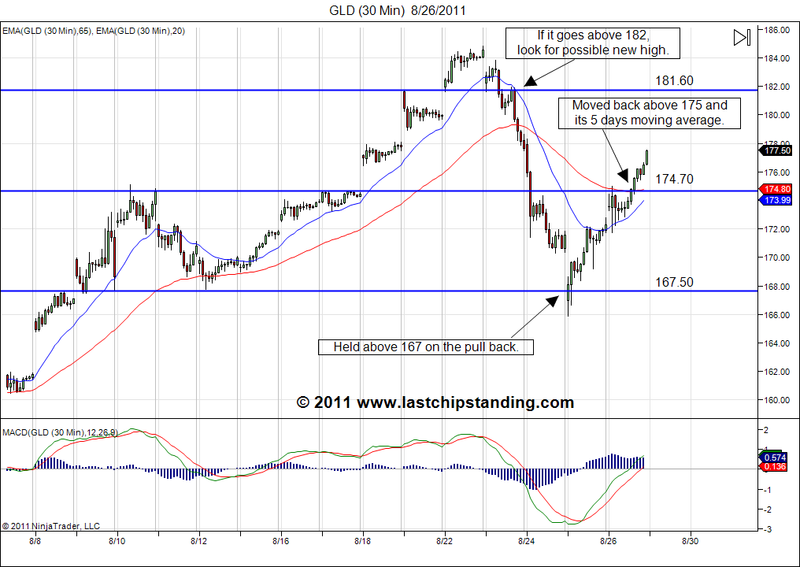 Looking at the 30 minutes price chart for GLD, it shows the price moved below the 167.50 support level briefly. 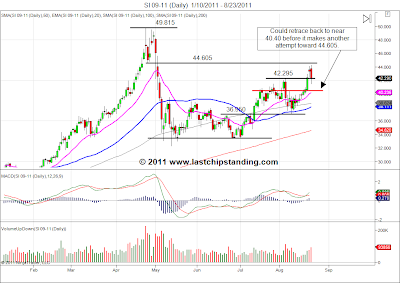 In the last trading session, GLD moved back above the previous R&S level near 175 and held above its 5 day SMA. 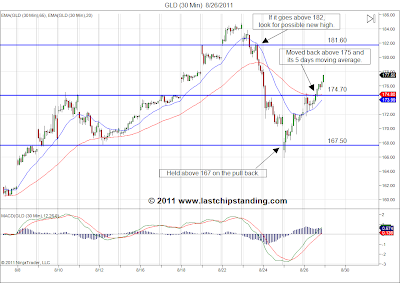 If GLD continue to move up and break above the 181.60, it has the potential to make a newer high. 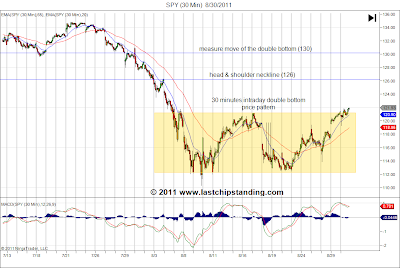 But if it hit resistance between 175 and 182, lookout for a possible H&S pattern that could lead to lower prices. 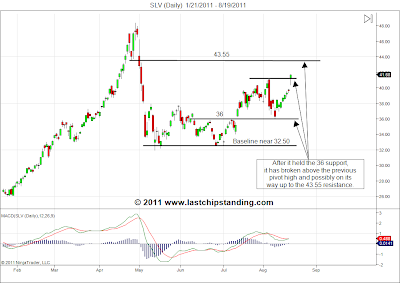 Silver retraced along with the sell off on gold. 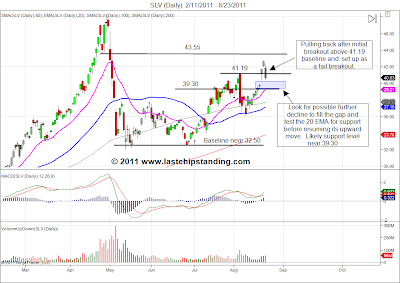 The price of its ETF, SLV pulled back and filled the recent up gap and held above the 50 SMA. 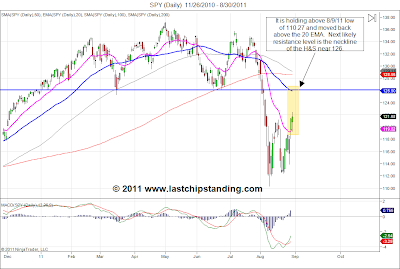 The daily price chart showing it could be getting ready for another move toward the 43.55 resistance level and possibly toward making a new high. 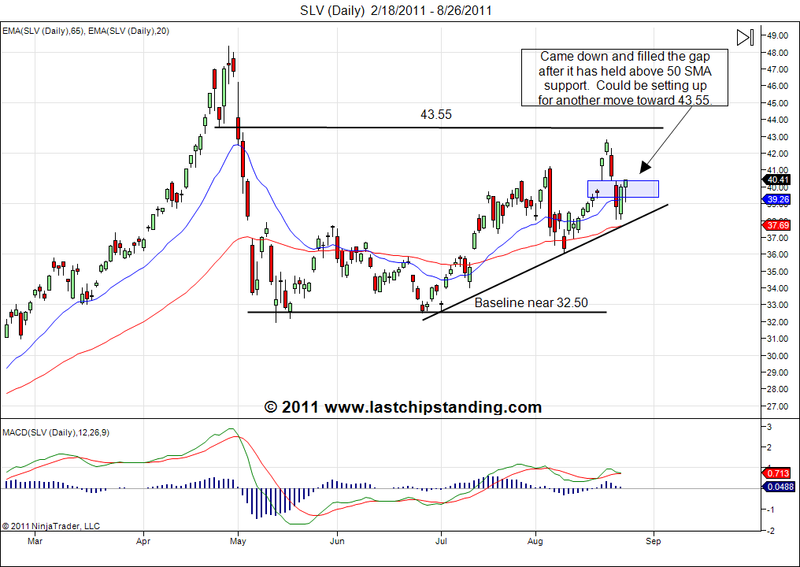 The key support to watch for SLV will be its 50 SMA and the resistance level to watch is 43.55. 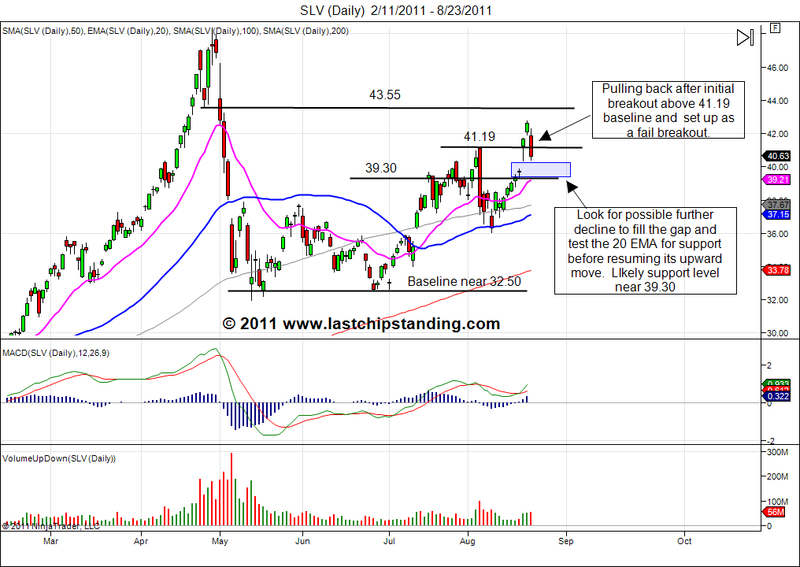 Unless GLD forms a head & shoulder pattern in its 30 minutes chart and SLV breaks below 50 SMA, the short term trend bias for these two shining metals is up. After 7 consecutive days of rising prices, profit taking finally hit this shining metal, silver. For those traders that went long when silver was hovering around the 20 EMA near the mid 38 level, taking some profit here seem to be a prudent thing to do. 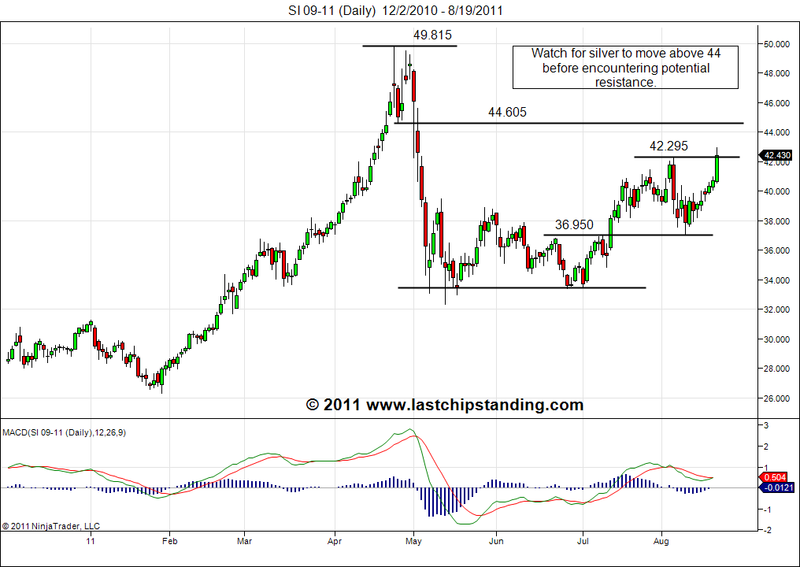 This pull back in silver prices does not appears to be a trend reversal. 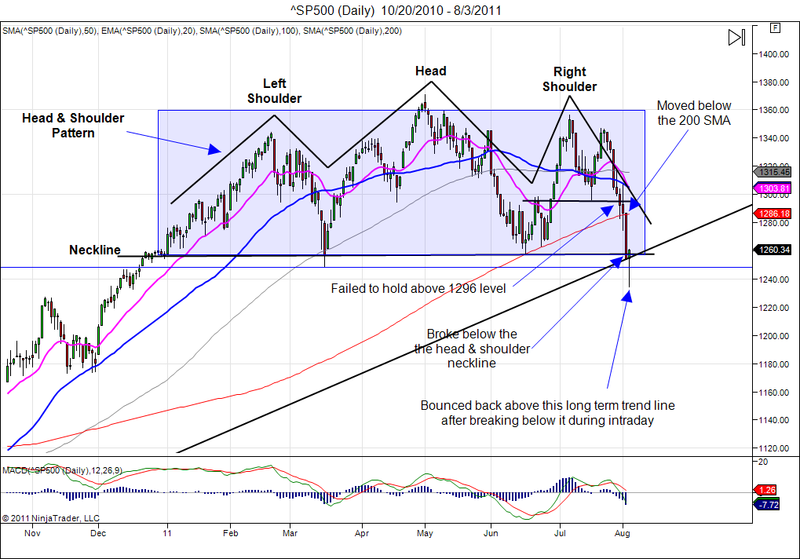 The price actions still pointing toward potential higher prices until a technical breakdown has occurred to indicate otherwise. 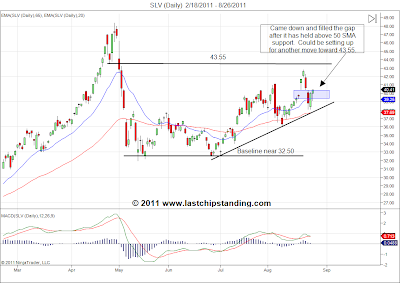 The level to watch for possible support for the silver future SI_F is near 40.40 and for the ETF, SLV is 39.30 (near their respective 20 EMA). 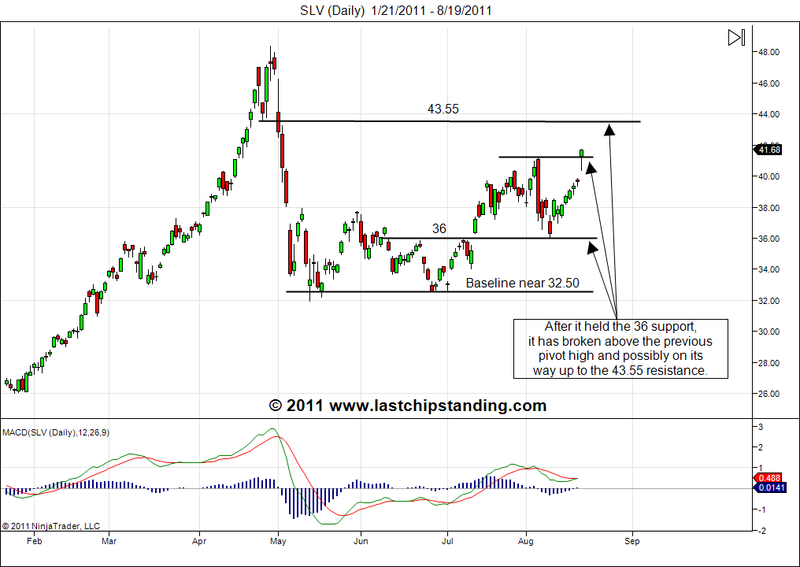 Silver is on the move once again after spending couple months building a base near the $33 area. 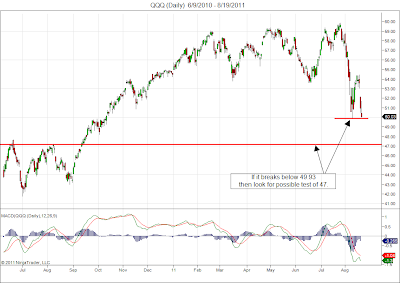 Looking at its ETF price chart, it has formed a base near the 32.50 level. 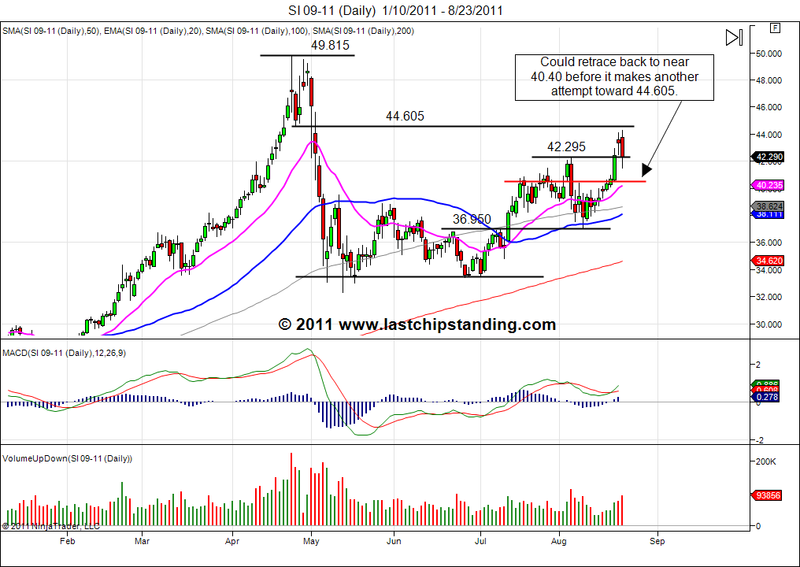 After having completed its test for support near the 36 level, it has broke above the previous pivot high of 41.73. 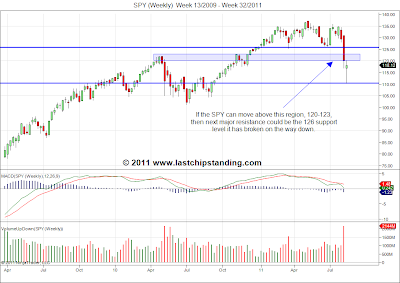 This breakout appears to be forming a higher high/higher low price pattern that could lead to a new high. 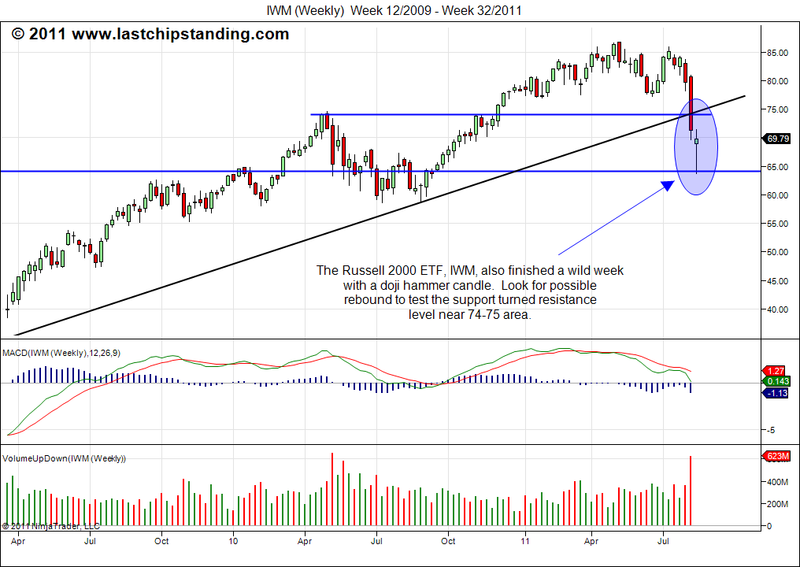 Last week, the major market indices bounced a bit then they resumed to their downward trend. 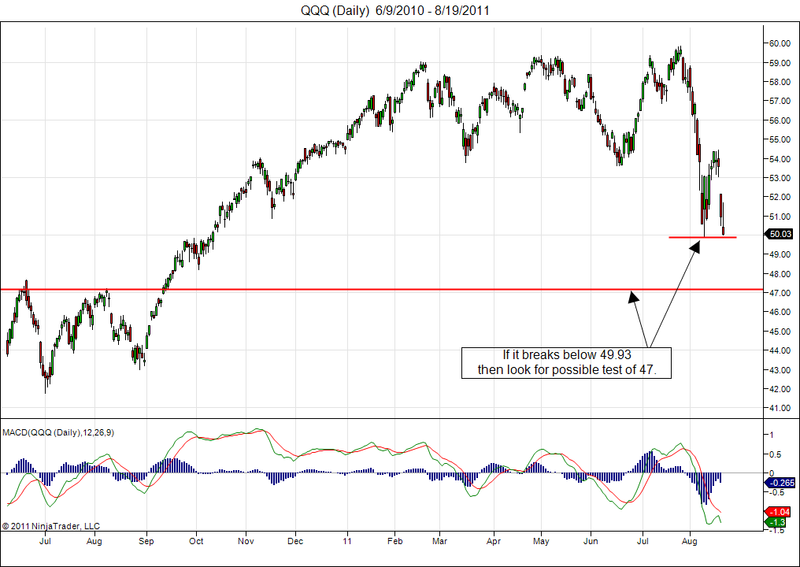 As the OpEx week came to a close, these market indices sitting near their August low. 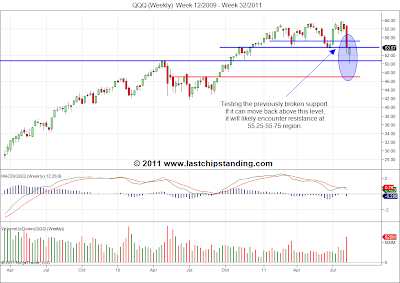 When the new trading week begins, look for the market to make an attempt on finding support near the August low. 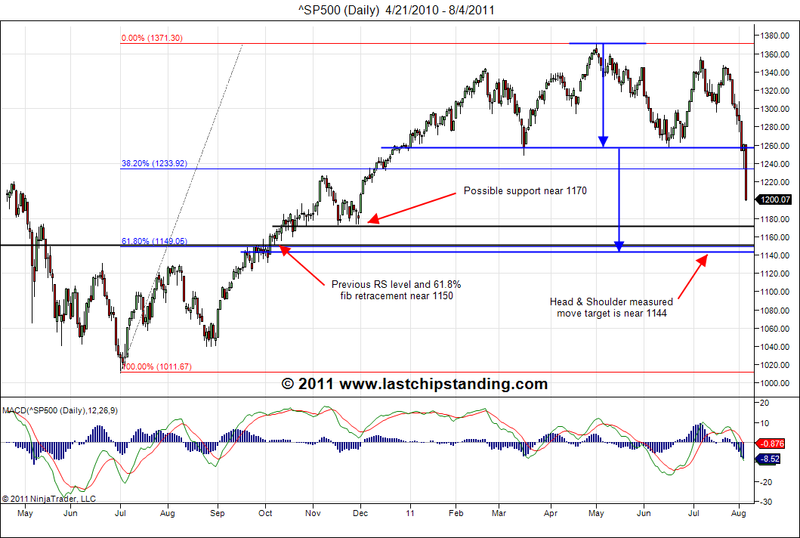 If it fails to hold above this low, then the likelihood for the market to dip into the support/resistance levels made in August 2010 is high. 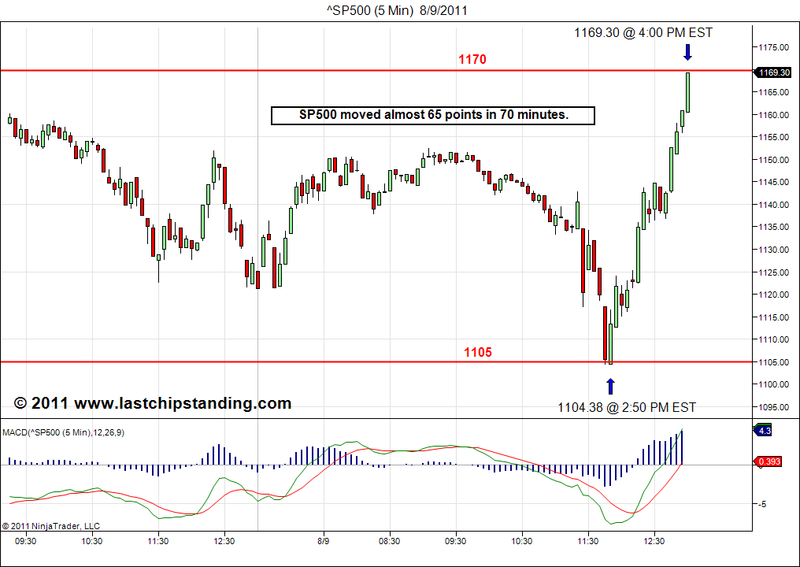 This is a tricky period to initiate new shorts and definitely dangerous to go long. 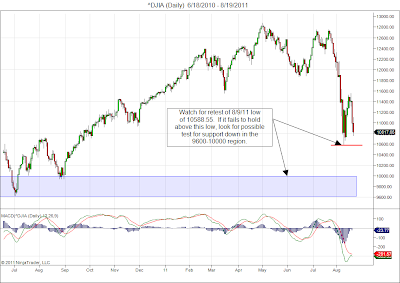 I will remain very cautious until the market either breaks below the August low or it has formed a short term reversal of higher low/higher high pattern. 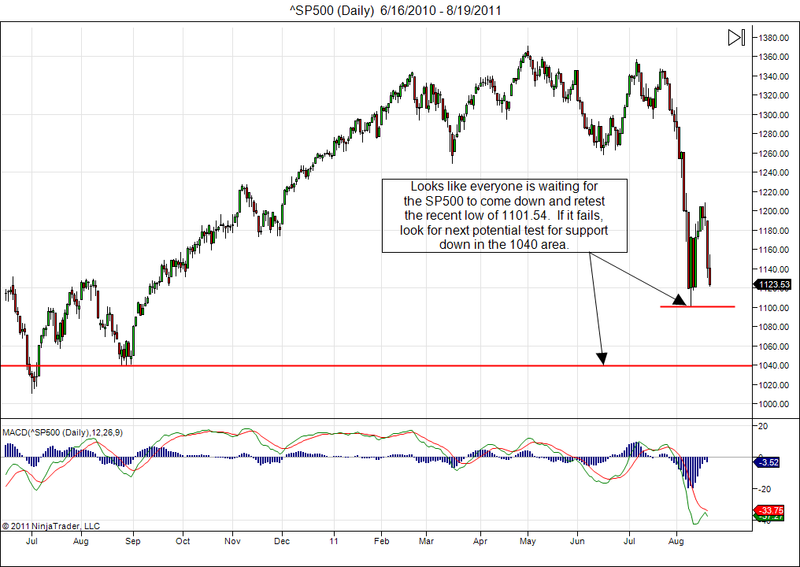 Here are the updated charts highlighting some critical levels to monitor. 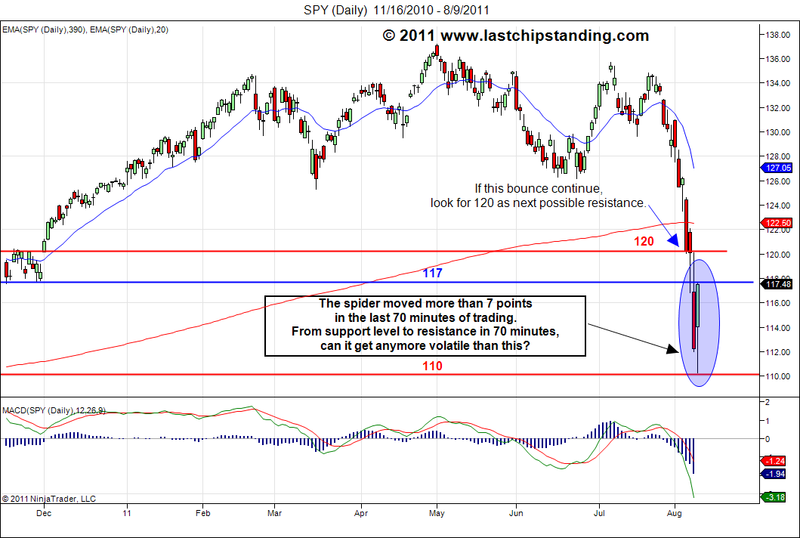 Get ready for more volatility in the market after last week's wild ride. This week is another OpEx week and that usually create some volatility as various hedged positions unwind and/or rolled over. During the recent market decline, the market has been very respectful to the technical levels. This seems to indicate majority of tradings are predominantly computer driven(HFT & Algor). 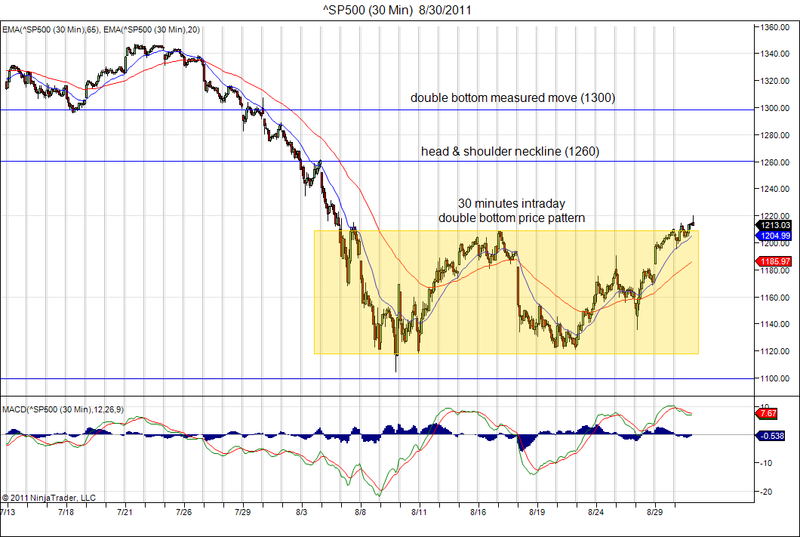 From the price actions shown in the charts below, a market rebound seem very likely. 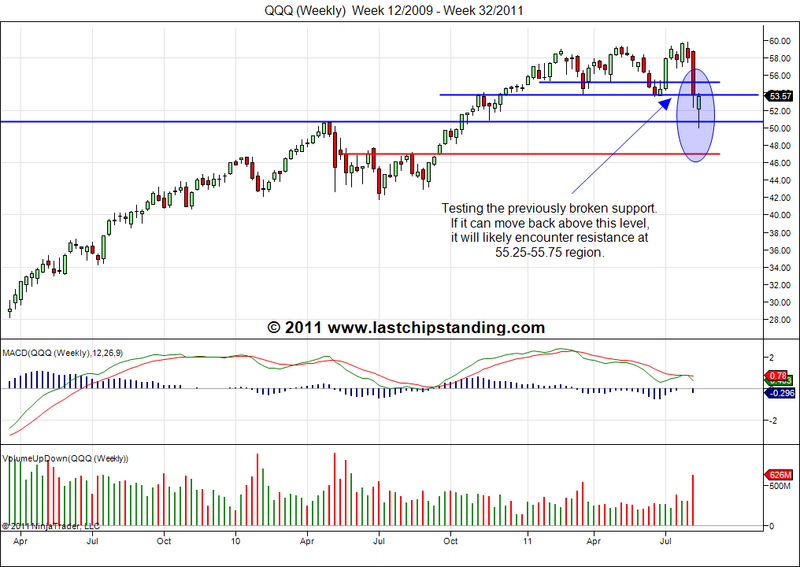 This rebound can take the indices back up to test the previously broken support level. 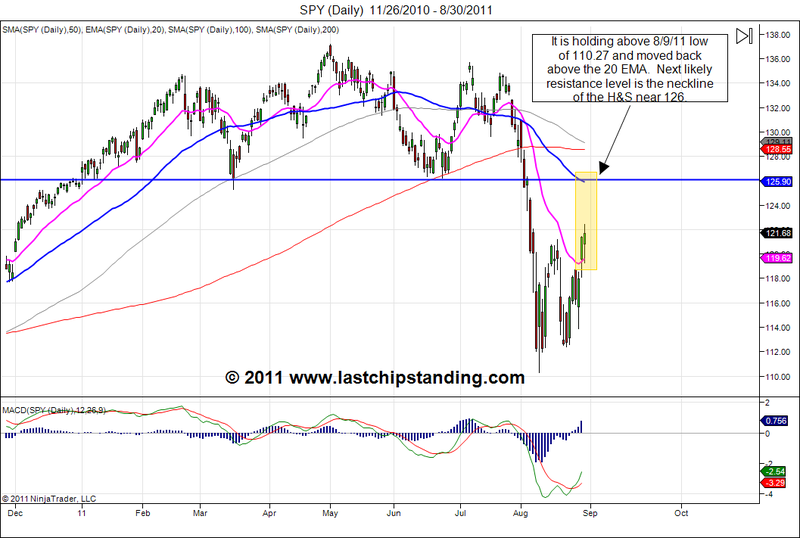 I will not interpret this rebound to be a start of a new uptrend. 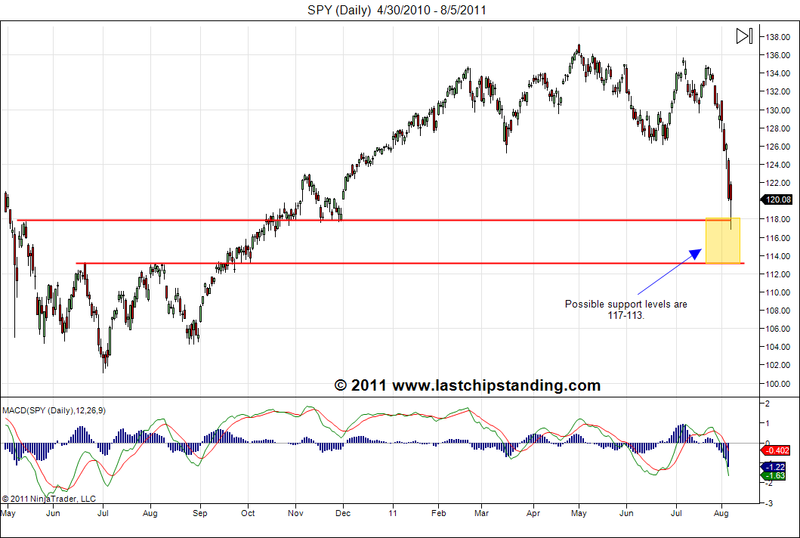 Until the previous low has been tested and a period of consolidation has occurred, I will remain on the cautious side. 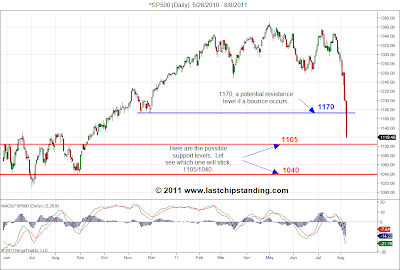 Both, the 1105 support level and the 1170 resistance level I have posted for the SP500 in my previous post got hit within the last 70 minutes of trading today. Doesn't this remind you of 2008? 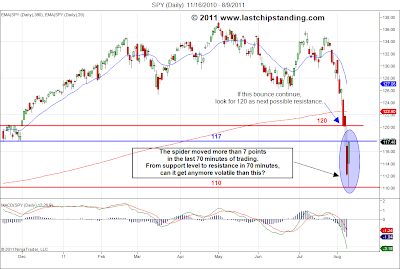 Take a look at these charts for the SP500 and the SP500 ETF, SPY. 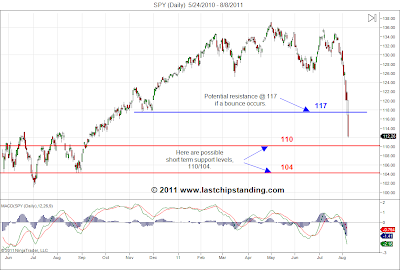 If SPY can hold above the 117 level and continue to move higher, then the likely resistance level will be near the 120 area. 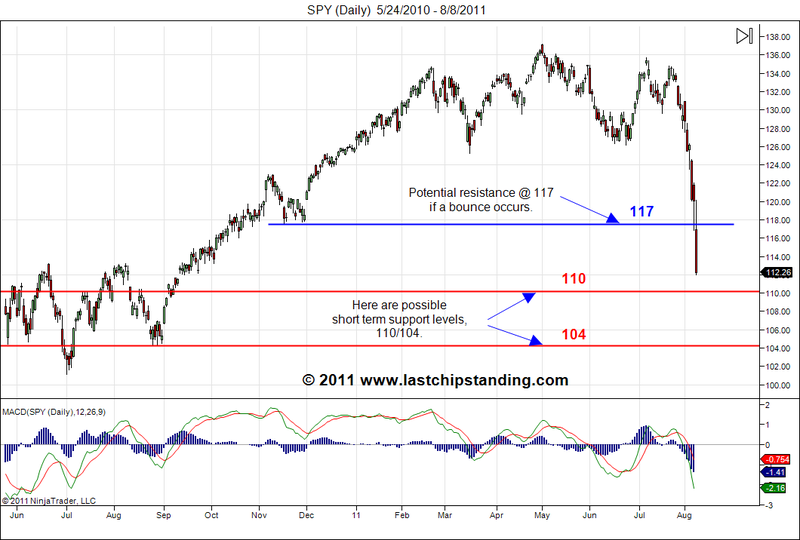 And when it revert back below or can't hold above the 117 level, look for it to retrace to the potential support level of 110. 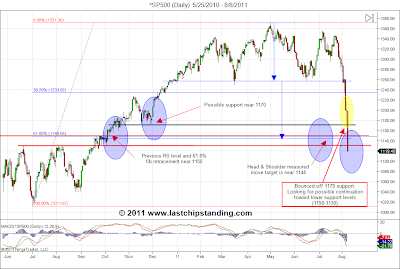 If it fails to hold the 110 level, then this confirm today's rally is simply an oversold rally (or a short squeeze) and monitor the 105 level for possible support. 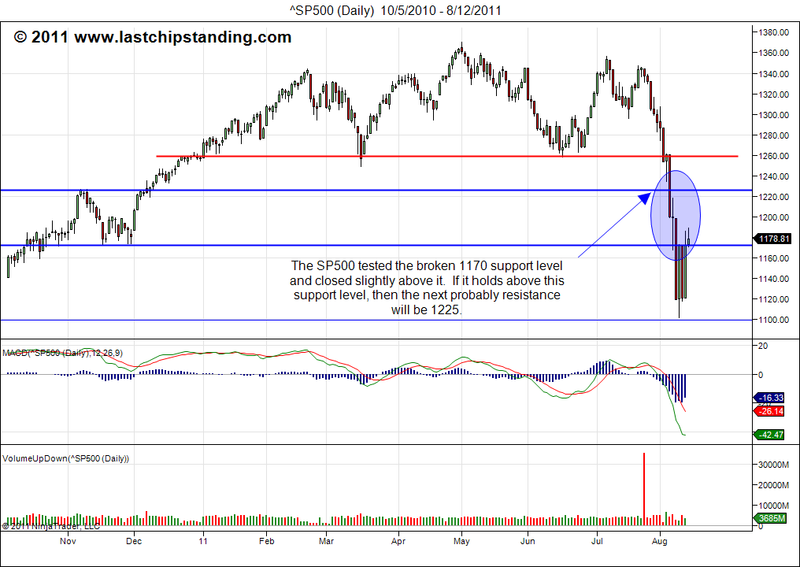 Here are the next set of potential support and resistance levels. 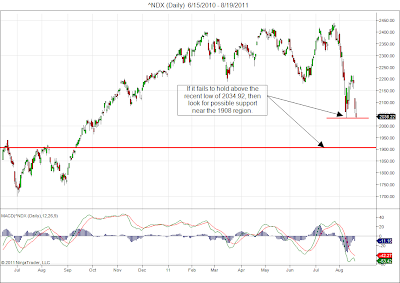 The key level to watch is 1040. 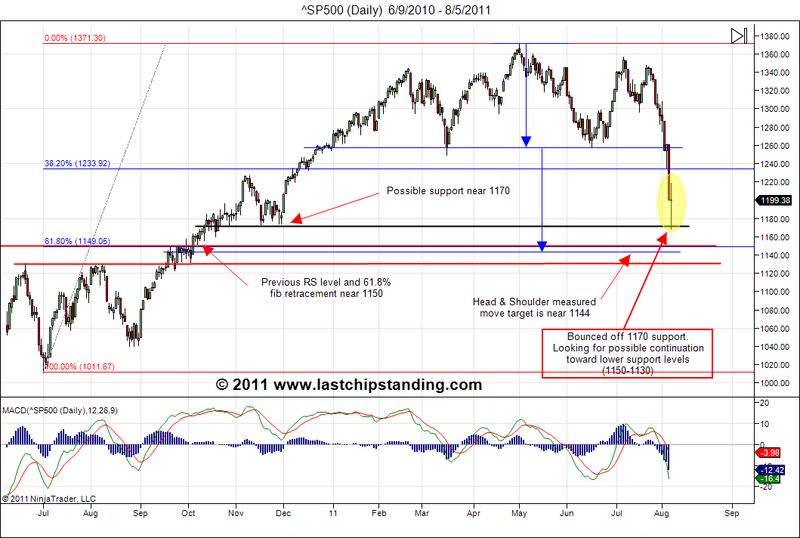 If this level is broken, the SP500 could go below 1000 and things could get ugly. Blood is flowing on Wall Street today. Nothing was spared, including gold. 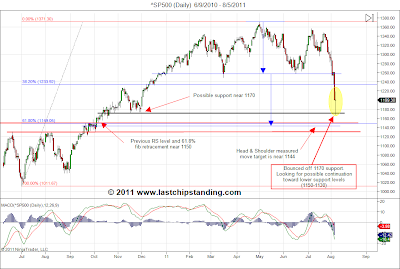 It looks like the bleeding might not stop until the SP500 get near the 1150-1170 region. 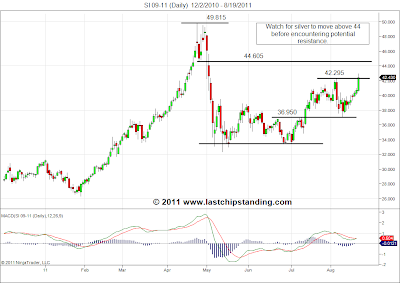 The Head & Shoulder measured move put a target near 1144 if this price pattern plays out. 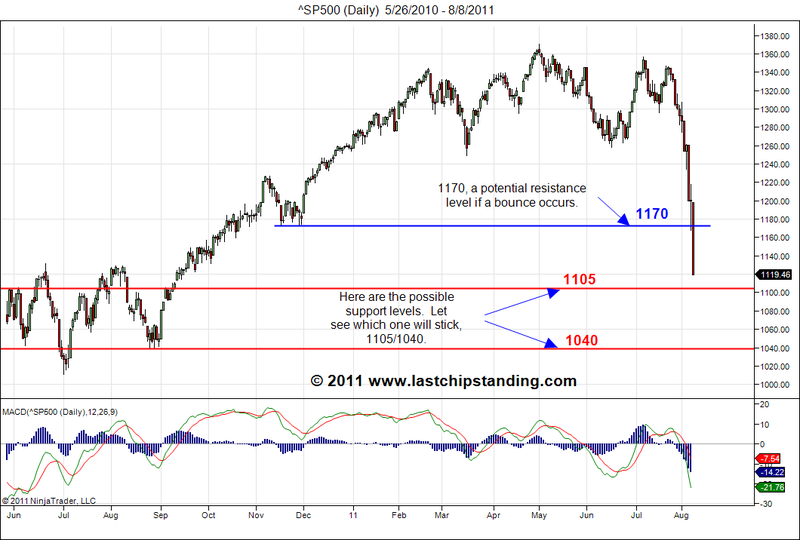 Another possible support level is the minor support level near 1170 that was established back in Oct/Dec 2010. 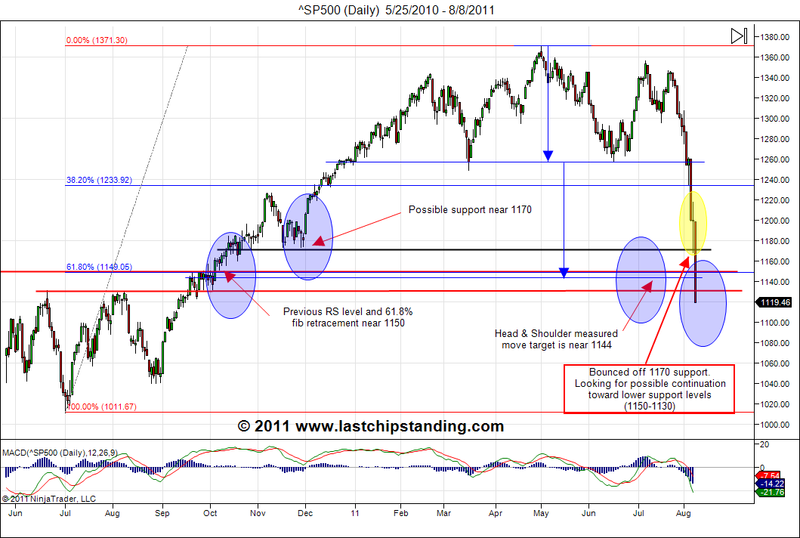 The most likely support level is the 61.8 Fib retracement level near 1150 from the impulse move between the low of July 2010 to the high of May 2011. 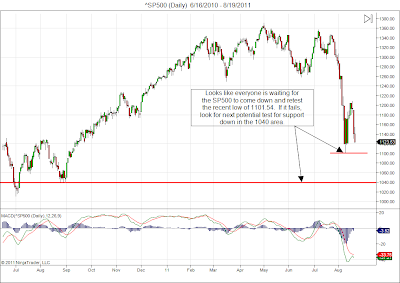 Keep an eye on these level for possible support for the SP500 (click on the chart to get a larger view). 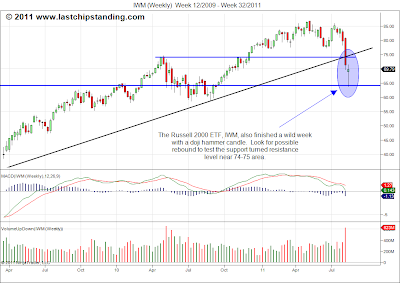 Is today's price action a head fake or a dead cat bounce? 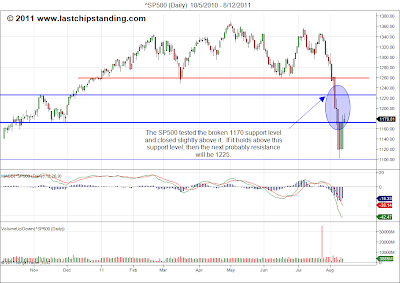 Lets take a look at the inflection point that the market has reached during the first few days of the week and some of the technicals that have converged. 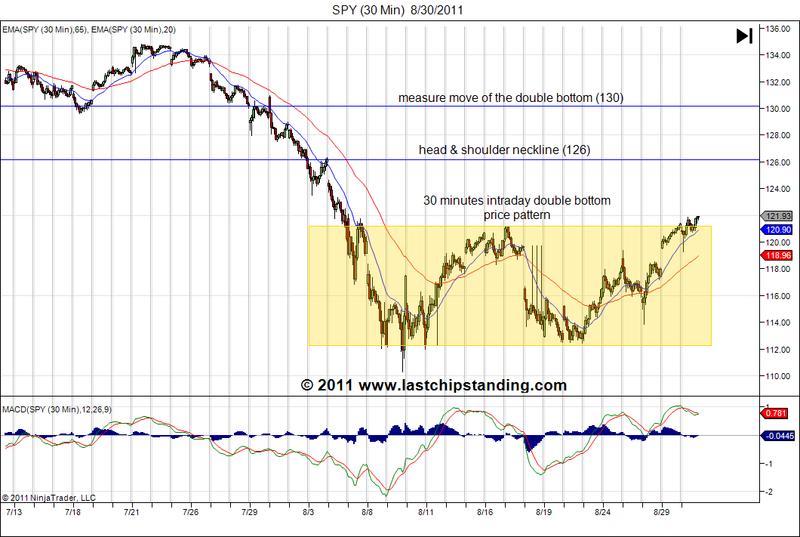 The first and foremost is the formation of the head & shoulder price pattern. 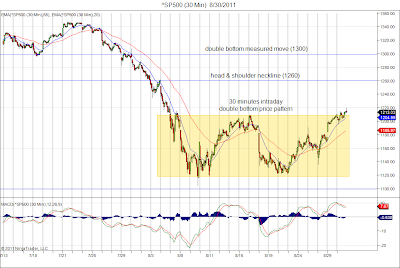 Yesterday, the market sold off and broke below the H&S neckline. 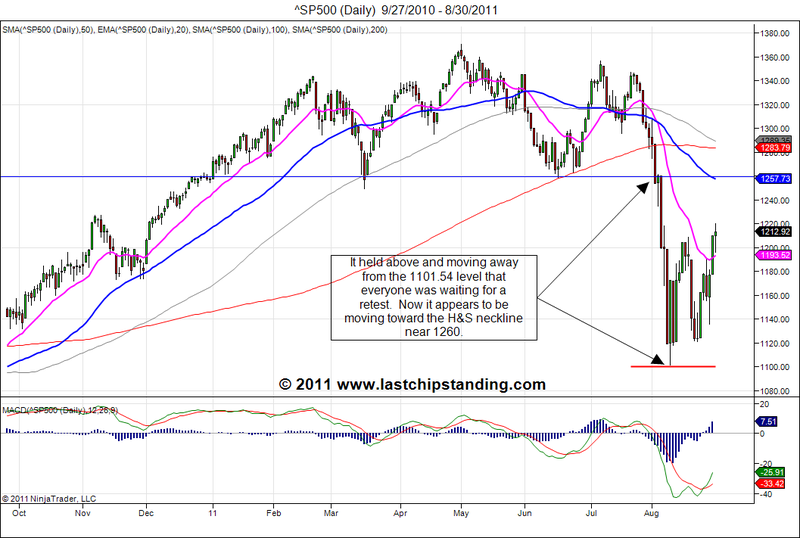 Prior to breaking the H&S pattern, the SP500 gave up the 1296 level last Friday. And after an agreement on the US debt ceiling was reached over the weekend, the SP500 opened with a large gap up on Monday and faded until the ISM number came out. 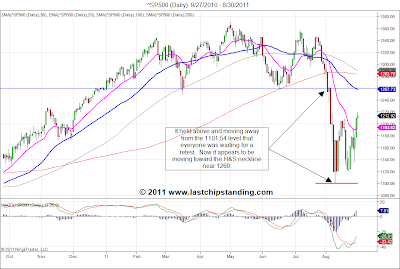 The fade became a sell off that continued into Tuesday when the SP500 broke below the H&S neckline. 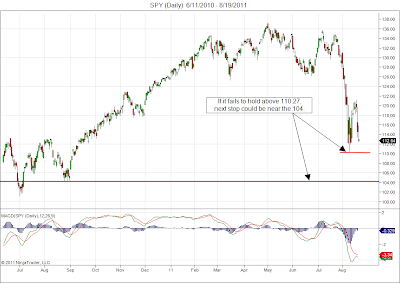 Today, the sell off continued with a break below the long term supporting trendline that was formed between the March 2009 low to the present. Then buyers stepped in when the SP500 dipped below 1235 and rallied to close slightly above the supporting trendline with a bullish long wick hammer candle. 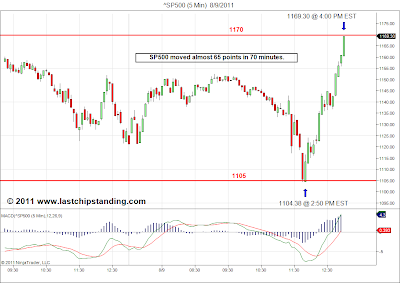 So will the market continue to rise or will it resume its drop? 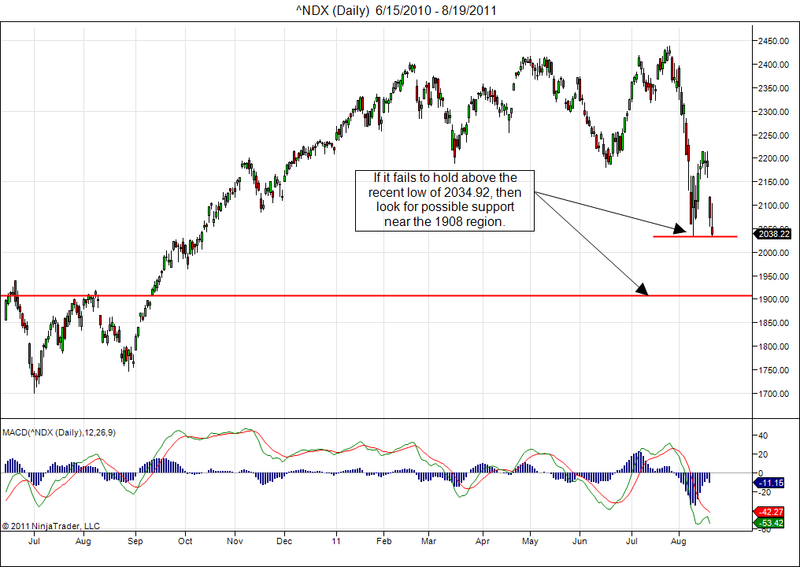 From the standpoint that the market will frustrate maximum number of participants, it will do both. One scenario is the market will continue with this dead cat bounce for a few days to generate a bit of bullishness. 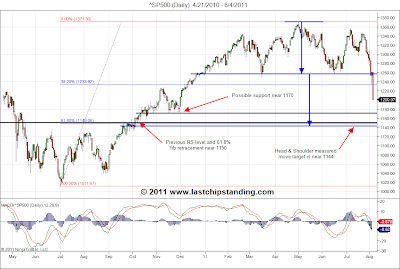 Then as quickly as the bullish sentiments started to settle in, a new round of selling will trigger to take the market down to the 1225-1228 level and forces the long overdue capitulation before the seasonal summer rally/back to school rally starts. 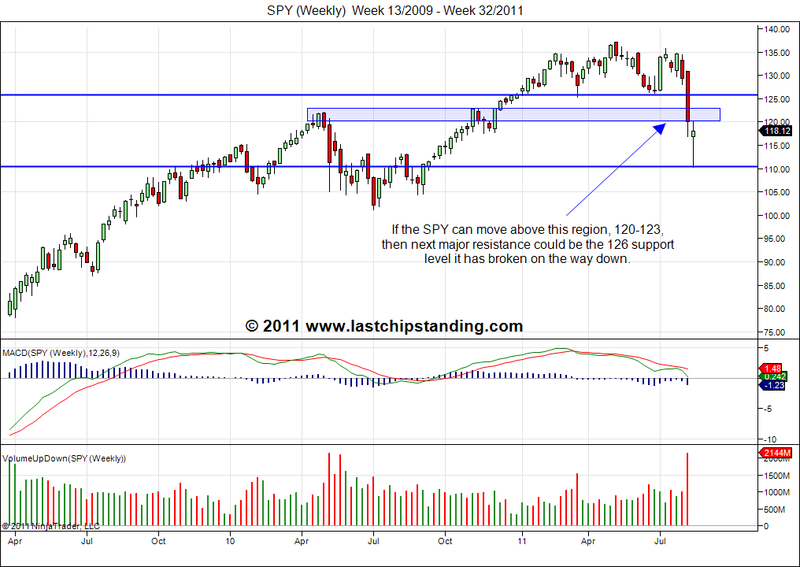 This scenario is just one possibility...remember, the market will do what it will do, not what we want it to do! We trade base on what we see, not what we hope.